Our first solar electric installation was a water pump – using modules from Arco Solar, a Monitor ZA jack pump and batteries – it worked! Today we provide quality photovoltaic direct drive pumps from established manufacturers, with controls to match power output and motor needs. From deep well pumping to presure systems to garden pond pumps, we can provide the right pump for your needs. Please visit our consulting page for a Water Pumping Worksheet. Our dedicated staff with 30 years experience in Solar Electric Systems will review your information and specify the right equipment for your needs. For 30 years, Dankoff Solar Pumps have been used for water supply and pressurization in a multitude of applications such as drip irrigation, livestock watering, water purification for medical clinics, domestic water pressure and many more. 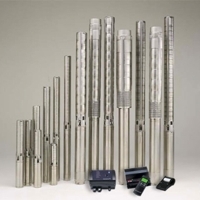 The Grundfos SQFlex system is more than just a pump. It’s a total concept tailored to any individual requirements. By examining some variables, Grundfos and the WaterMaker can put together the perfect combination for any purpose. All they need to know is the location, the water table depth and how much water is needed, and they will be able to find the most efficient energy source for the system. SDS Series – Low-cost submersible, 1/2 to 5 GPM with up to 230 ft of lift. SCS Series – High-power submersible, 2 to 200 GPM with up to 700 ft of lift. 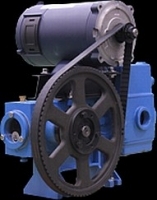 Centrifugal Surface Pumps (SCB, SJT, SCP & SC Series) – High volume low-power surface water pumps. Circulation (pools & ponds); pressure boosting (home pressure systems, sprinklers); shallow wells. 5 to 100 GPM, 120PSI, up to 277 ft of lift (above ground). 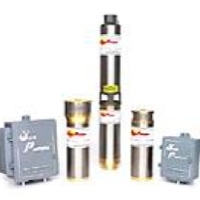 SPB Piston Pumps – High-power low volume surface water pumps. 1/2 to 12 GPM, 1000 PSI, up to 2300 feet of lift (above ground). SHURflo’s Solar Products consist of pumps and accessories ideally suited for operation on solar power. Low amp draw, consistent performance, and long life make our solar pumps perfect for use on the range, in the solar home, or wherever highly efficient DC powered fluid delivery is needed. These pages offer useful product data for configuring your solar pumping system. SHURflo has a network of knowledgeable solar product distributors ready to help you find the right SHURflo products for your solar project. The Sunrotor product concept is to deliver the most reliable and durable solar powered water pumping system at a reasonable and very competitive price. SunRotor pumps are extremely reliable and have developed a strong following in agricultural applications and in developing nations where reliability, simple maintenance and long life are critical. Featuring both helical rotor and centrifugal models, SunRotor pumps carry a 5-year US warranty (2 year full replacement and 3 year declining).